A small scout ship is lost in a green nebula. The TARDIS brings the Doctor, Tegan and Turlough to rogue planetoid 852Z Alpha in the far future, the green nebula is in the sky. They learn that the Peace Engine was held in the Great Hall and all set out on a skimmer across the ruined city. The Doctor looks up at the sky. Is it me or is that nebula getting closer? One thing at a time Doctor. They are herded into the cavern where the Doctor discovers the weapon has already been taken. Marni reveals herself to be a Rutan in disguise, hidden among the crew. "We have the Peace Engine. And you Doctor will show us how to work it." The nebula is almost on top of the planetoid and revealed to be where the Rutan strike force is hiding. The Sontarans are disarmed and put in the prison but soon escape with help from the Doctor and his companions. But the Doctor has a nagging doubt- how did the Rutans evade the Sontaran's sensor? The Sontarans act stealthily, planning to seize the Peace Engine. The Doctor, Tegan and Turlough find the Sontaran scout ship lost in the nebula. But there is no sign of the pilot. They are captured by Rutans who try to force the Doctor to work the Peace Engine but the Sontaran leader starts a fire fight in which the Doctor sends Tegan and Turlough to the scout ship while he plans to stop the Sontaran making a big mistake. The Peace Engine itself is a vast metal container, housing a swirling vortex of energy. The Sontaran leader stands on a gantry above the vortex, about to throw himself in. The effect will be to wipe out any non Sontaran being. But the Doctor has realised the truth. They’ve absorbed Sontaran DNA into their genetic make up. That’s how they evaded your sensors! Alien filth. They dare to contaminate our DNA! Use this device and the only thing left alive will be you and the Rutans. It won’t end the war, just perpetuate it for ever more. The Sontaran pauses, allowing the fire fight to begin anew. The gantry collapses under the Doctor tumbling him into the Peace Engine vortex. One by one everyone at the facility is vapourised, Sontarans, Rutans even Tegan and Turlough until only the Doctor remains. 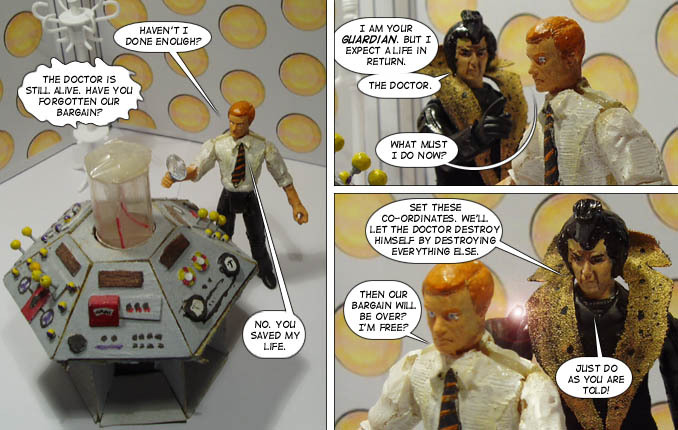 The story uses my custom figures of the 5th Doctor, Tegan, Turlough, Sontarans and the Black Guardian. Rost was also an unnamed builder from the C.O.R.P.S. figures by Lannard. I guess I was inspired by the massive finales of the new Doctor Who series. I wanted a big bang story that ended on a cliffhanger so massive that it would seem that it couldn't possibly be undone and leave audiences hungry, desperate to know what could possibly happen next. And it is a big one. The Doctor has erased all life in the universe apart from Gallifreyan! The only settings that were filmed were the human facility which uses the same sets as Firestorm and was shot at the same time (September 2006) and the TARDIS interior, along with several of the stories that never made it. It's the same old story. While this was being filmed, I was also working on stories for the 5" figures. Those figures and the new TV series were certainly the order of the day and the classic series wasn't getting much love or attention so it was abandoned in favour of adventures for the (then current) tenth Doctor. Had things gone according to plan, this story would have been posted in January and February 2008. Given that I was filming it in 2006, that's really thinking ahead.